There is an appeal doing the rounds to save Deepalaya – a low budget private school running since 1992 that teaches slum children in Sanjay Colony at very nominal fees. It is not compliant with the Right To Education Act, which makes it a (wait for this) criminal offense to teach children in unrecognized schools. That is right. Teaching children can be a CRIME in the land of free and compulsory education if the school is not recognized. One would be forgiven for thinking it is a terrible school and is not recognized because it doesn’t meet the standards the government has set for the well being of children. One would even be forgiven for thinking that in a world where being ignorant on politics is a sort of fashion statement. Yet, for a school that proudly claims 100% results for their third grade students in the Open Basic Exams conducted by NIOS where the topper Roshan of class III scored 94%, Abhishek and Rupa from class V scored 94% each and Alka of Class VIII scored 86% – Is this not the schooling system’s grand dream? Big numbers showing that children are being educated well? This, by schooling standards is a result that should make any education authority grin, but the school is not recognized. It has a student to teacher ratio of 30:1 – which I dare say many government schools don’t meet. Their website proudly boastes of students who went to the US on scholarships and returned to add their efforts to the cause of education. So why is this school unrecognized? It is not recognized, because it operates on leased land. 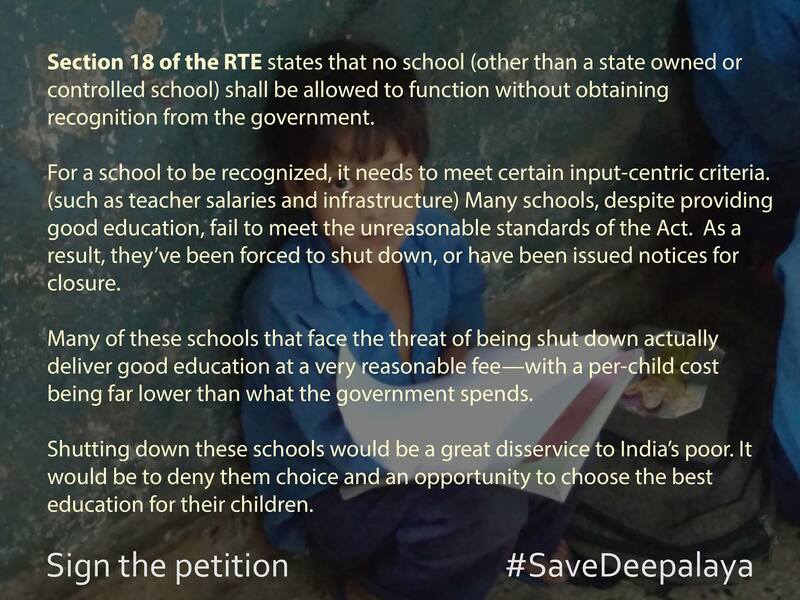 As per theDelhi School Education Act of 1973 (DSEA), schools that don’t own the title to the land they operate on cannot be recognized. 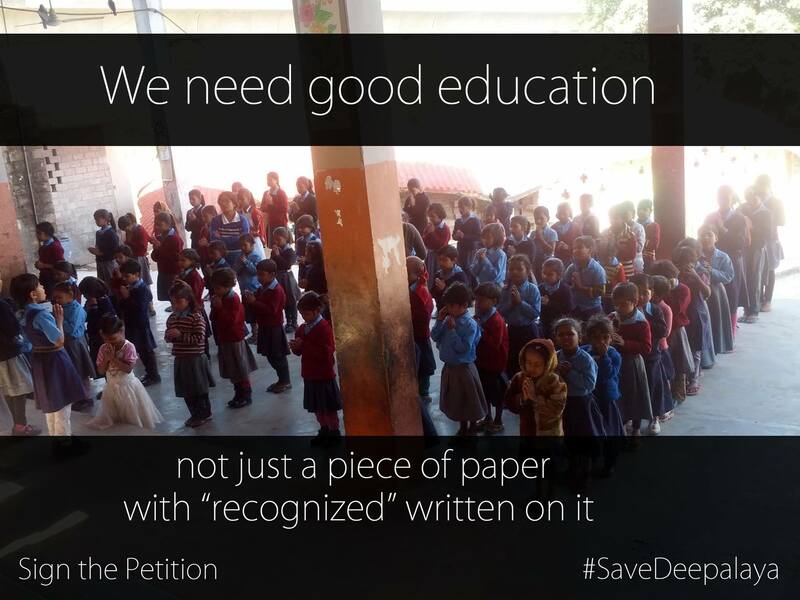 As per the Right To Education Act of 2009, unrecognized schools are illegal. For the life of me I cannot fathom how the ownership of the land on which children learn has anything at all to do with the child’s Right To Learn, yet here are parents doing the “CRIME” of sending their children to school. This school is going to be shut down, which brings us to this completely ironic situation of a homeschooling blog speaking to help protect a school from an act that intends to educate all children whether they want it or not. They have a petition going at Change.org, which I recommend you sign in solidarity, though I don’t have the foggiest on what that will achieve. Issue an ordinance to exempt schools in slums and villages from the land-title requirement for recognition until the law is amended. Make recognition criteria in the Delhi School Education Act and rules reasonable for quality low cost private schools to operate in Delhi. This is one way of doing it. I highly recommend that people alarmed by this absurdity in laws that govern the futures of some of the most precious citizens of India use the election frenzy staring into everyone’s faces in Delhi to make a point to political parties that this kind of absurd lawmaking is not appreciated and that all parties should commit to fixing this if they win, because otherwise they simply are not worth voting for. There are some signs of Aam Aadmi Party supporters supporting the school’s right to function, but a more concrete comment by official spokespersons will be better. BJP and Congress too should agree to do this if they come to power. There is really nothing about the demands that is objectionable. They are a product of absurd laws creating problems for citizens and utility to no one. The Save Deepalaya campaign also has a Facebook page which you can like and engage with them to keep an eye on what they need and be ready to help in whatever capacity you can. This entry was posted in RTE News on January 30, 2015 by vidyut.